Make your grad’s party a hoot by making it owl themed! Show family and friends you’re the wise one with owl invitations, favors, party décor, and more. If the guest of honor is an academic or just enjoys nature, they’ll love everything from the centerpieces to the card box to the well wishes from guests at the sign-in table, preparing them to fly off to college and beyond! Timing the invitation delivery for your party is essential because graduation season (May, June, and July) is often crowded with weddings, baby showers, family vacations, and other graduation parties. This often means that guests’ social calendars quickly fill up, sometimes months in advance. Make sure your most important guests will be able to attend by setting a date in January. Consult with grandparents first and have them save the date, so they are guaranteed to attend. 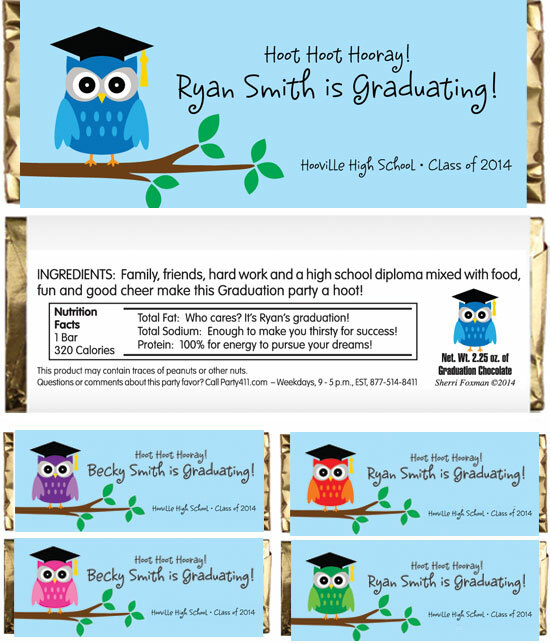 Send out a personalized owl theme invitation! Add graduation confetti that matches the invite to give your friends and family a surprise when they open the mail. Want to let everyone know your grad is turning the tassel? 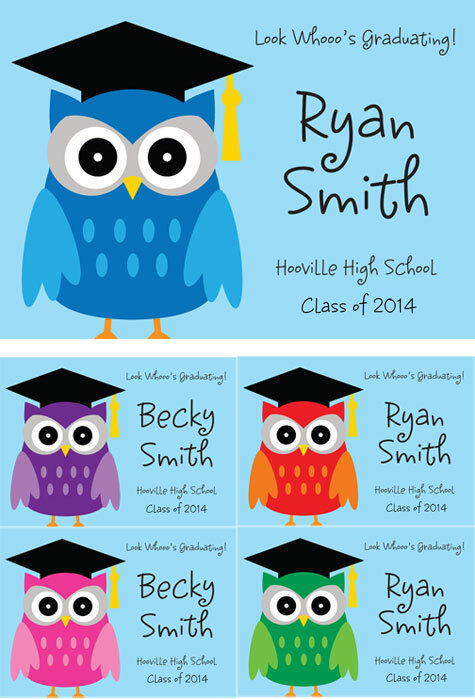 Mail an owl themed graduation announcement to let family and friends know they're going to cross the stage! These announcements also work well as save-the-dates for the upcoming graduation party season. Make the invitation a special memento and go all out for your grad by ordering a custom graduation invitation. To tie in the theme, perch owls in a tree overlooking the graduate wearing a university sweatshirt with books piled high in their arms. Please join us at our nest for Emma’s Graduation Party! Fly on over to celebrate with Sarah! Whatever you decide, make sure to send your invites 4-6 weeks in advance so guests can RSVP early with a YES! Owl Theme Banner: Hang this sign over the front door or your sign-in table. Feel free to hang it out of doors on a deck or tent - it's water resistant. Owl Theme Water Bottle Labels: Hand personalized water bottles out to guests on a hot summer day. Include a message on the back to honor your bright grad. Life-Sized Graduate Cutout: The grad may be too busy to welcome every guest to the party, so surprise your guest of honor, family, and friends with a life-sized cutout at the entrance! For an evening grad party, incorporate owls, stars and lanterns throughout your party space for all of your night owl guests! Owl Lanterns: Use paper lanterns to make hanging owls. Cut large eyes from black and white construction paper, and a beak from orange. Glue the eyes and beak directly onto the lantern, and hang with white string lights. These lanterns will make quite an impression over a buffet table or in the roof of a tent as the party goes into the night. Balloons: Light up the night with LED balloons, and place bunches of them on the buffet and sign-in tables. Your guests won’t be able to miss them! Weigh them down with sparkly star balloon weights. Try using a large chalkboard propped up on the sign-in table, asking guests to leave well wishes and advice for the new grad. Label the board “Words to the Wise”. Perfect for an owl theme! Use small chalkboards as table numbers to direct guests to their seats, too. Cut a large square of craft paper and mount it on a wall by the sign-in table or entrance. Create large curls at the top and bottom to make it look like a diploma. Don't forget permanent markers so guests can leave words of advice to the guest of honor. Owl Cupcakes:Make owl cupcakes by twisting apart two Oreos and using the cream half to make eyes. Use brown Reese’s Pieces as pupils and an orange one as a beak. Arrange 8-12 of these treats on a tiered cupcake tray in the center of the table. These cute cupcakes are both a dessert and decoration! Piled Books: Stack an assortment of books in the center of each table and tie them with a vintage book strap. Perch a stuffed animal owl or a graduation cap on top. Add a bunch of graduation balloons to finish off the look! Oak Stumps: Place a small stump in the center of each table. Stack pillar candles on the top to give height to your centerpiece. Branch Centerpieces: Fill a tall vase with an assortment of branches and hang bird and owl ornaments from the sturdy ones. Graduation Tabletop Lanterns: Keep it simple with a tabletop lantern, and customize with a picture of the grad! Pine Cone Confetti: Scatter mini pine cones as confetti. Love the woodland look! Serve the guest of honor's favorite dishes at their graduation party! Keep it simple by serving summer favorites - like barbecue, pasta salad, and cold sodas from the cooler! Ask more helpful family and friends to bring side dishes or take the load off by having a local restaurant cater your grad party. Make sure to keep trays of delicious buffet food on ice and out of the summer sun! Giant Lawn Games - These are all the rage right now! You can rent or buy giant Jenga, Connect Four, chess, checkers, and more. Try spray painting red, blue, yellow and green circles on the grass for Lawn Twister! Water Games - On a hot day, you can't go wrong with a water balloon fight! Get a water balloon sling shot and a slip n slide for extra fun. Bonfire - If your grad party goes into the night, set up a fire ring with campfire desserts (think smores, banana boats, and pie irons!) Make sure to have plenty of seating! These graduation party games are perfect for indoors or out. Choose a few and don't forget to hand out awesome prizes to the winners! Then pass it around the group and have each person feel the items through the bags and write down their guesses. Then open the bag to see how many are correct. Give the person with the most correct guesses the entire bag. Wrap a graduation theme prize (like a university sweatshirt for a high school grad or a bottle of champagne for a college grad). Make sure to wrap it in 25-30 layers. Have players sit in a circle. Player 1 puts on a pair of oven mitts and attempts to unwrap as many layers as they can! After 30 seconds, they have to pass the prize and the oven mitts to the next person. The person to tear off the last layer, wins the prize! 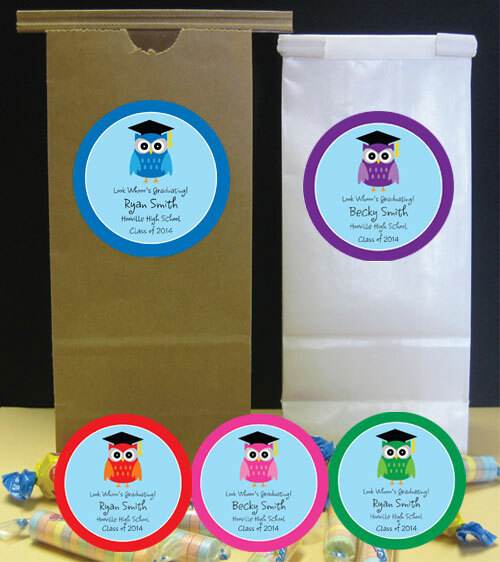 Of course, you'll need owl theme favor bags for guests to put all of their goodies in! Enjoy sending your new grad flying off to college! Congrats and good luck from the Party Girl and everyone at Party411.com.